Just heard on the wood surfboard forum. Dovetail had been a Swaylocks member for the past 5 years. Sad to lose a good guy. GOLD Coast surfer and shaper Geoff Moase has died while paddle boarding in the Indonesian surf. It is understood the father-of-one and owner of Dovetail Surfboards suffered from a medical condition while stand up paddle boarding in Lombok. He died of natural causes. Friends found him floating in the surf yesterday morning about 100m from the shore at Sorga Beach, local police say. A family member said he died doing what he loved and said ‘there was no shortage of good things to say’ about the 54-year-old. 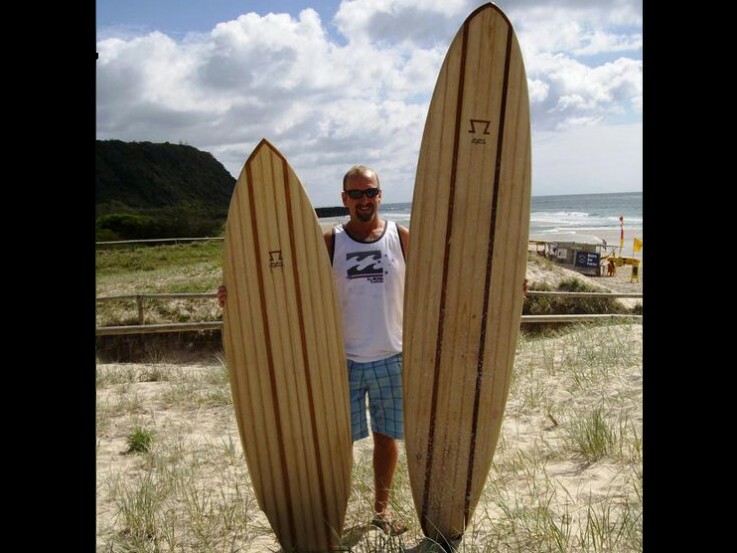 The passionate surfer and former carpenter was a quiet achiever who had just started to make a name for himself as a shaper of “stunning” timber surfboards. Mr Moase was on a surfing trip to the island with friends. It was reported Mr Moase, who lived in the Tallebudgera Valley, was “very weak” when he was helped from the water and taken to a local clinic, where he died a short time later. “We suspect he was hit by a harsh wave,” police chief Arif Budiman said. Police say a fisherman spotted Mr Moase floating in the water. Mr Moase’s friends rushed to the shore and tried CPR but the Australian was pronounced dead a short time later at a clinic. “By the time he was pulled from the water, he was already so weak,” West Nusa Tenggara police spokesman Amerun said. At his Gold Coast workshop, Dovetail Surfboards, Mr Moase crafted unique boards from Australian-grown plantation timbers. In an interview with the website surfcareers.com, he described it as his “obsession”. He said he had been fascinated by surfing since childhood. “At least half of it is just being part of a postcard-like scene,” he said. “Surfing reminds me that I’m lucky to live in a country that’s free.” One of those paying tribute to Mr Moase on Saturday was Burleigh Heads retailer Keith Davis, who saw his friend just before he left for Indonesia. Mr Moase’s passion fanned the creativity in others, including his musician son Jack Moase, Mr Davis said. He had been staying in the area for three days. It comes as the family of fellow Queenslander Peter Maynard continue a search for the keen surfer who has been missing in Bali since August 27. Mr Moase’s death comes after Australian Peter Luke, 27, died after being hit by a huge wave on a remote beach on the island of Sumbawa last month. I held Geoff to a high degree of respect for his craftsmanship as well as his fair mind towards business - He was he supplier of the beautiful Paulounia planks I use in my boards. The standards I demanded were better understood by him as a fellow board maker than by others before. It is a loss to my business - But obviously not to as great a degree as it is to his family and close friends. My condolences to his family and those who knew him better than me. Timber selected by Geoff to my specs - bookmatched beauty - I'll miss you Geoff!!!! Oldtimers know that time is coming and for me I can only hope to kick out doing what I love. Seems to me a man taken too soon. Na Iēhowa ʻoe e hoʻomaikaʻi mai, ā e mālama mai.